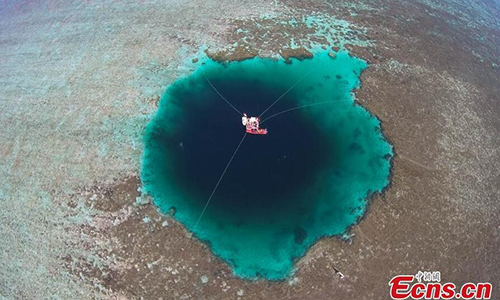 Sansha Yongle Dragon Hole, which is 300.89 meters deep, is now officially the deepest ocean blue hole in the world, China's National Marine Environmental Forecasting Center (NMEFC) announced on its Wechat account on Sunday. The hole is located in the Xisha Islands in Sansha, South China's Hainan Province, in the South China Sea. It had exceeded the Bahamas' Dean's Blue Hole of 202 meters in depth, according to the NMEFC. The almost vertical blue hole measures 130 meters in diameter at its top entrance and 36 meters at the bottom. The NMEFC has detected obvious water flows in the hole. Pictures reveal that the blue hole seems eerily like a time capsule, with the water creating a striking contrast to the turquoise that surrounds it. At least 20 kinds of ocean species live at the upper section of the hole, according to the NMEFC. A blue hole is a type of rare natural geographical phenomenon and is considered to be "the last mystery that protects the universe's secret of the earth." Most blue holes are formed from sinkholes or caves that develop slowly over time, as rock begins to erode and collapse. The term blue hole simply comes from the dark, navy waters that characterize these formations, according to National Geographic in 2017. The hole is of great scientific research value, and historical and cultural value. It demonstrates China's achievement in its history of sea protection, the NMEFC said.